To long-time building services employee John Oilar, the university’s engineering program epitomizes not only advancements in technology but also in artistic expression. “I’ve worked for four engineering departments, I’ve known a lot of engineers and I’m inspired by what they do. I’m inspired by their positive outlook and work ethic; they work constantly and love it. I draw like an engineer, I go step by step,” he says. Oilar’s art career spans over 40 years. As a college student, he studied art in Europe and sketched the rooftops of Florence. He graduated as an honor student with a degree in art from Western New Mexico University. Since 1989 he has had 10 one-man shows in Indianapolis, Crawfordsville and Lafayette. Oilar has been featured in international art magazines and is also a prolific writer with over 500 published articles on various topics. He feels that his career as an artist has been heavily influenced and supported by Purdue. His artwork can be seen in over half the major buildings on campus. 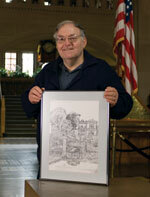 The Purdue Employees Federal Credit Union uses one of his drawings for a check design. Presidents Beering, Jischke and Córdova have each had their portraits drawn by him. His work has been featured in the Exponent and over 250 of his drawings have been donated to fundraisers and support groups. Oilar has designed the covers of Purdue textbooks and the logos of various campus groups like the Campus Safety Committee, of which he is also a member. Physics professor Ephraim Fischbach has lined the wall outside his office with nine of Oilar’s colored prints. As a staff member, Oilar has spent over 21 years in building services, which he compares to artwork, “It’s like art to the extent you are making something better and more appealing. Making areas more attractive and better to work in; plus it gives me time to think about my art.” Oilar’s partner in his artwork is his wife of 20 years and fellow Purdue employee, Diane. She organizes his shows, schedules and takes him to events, and is the person who convinced him to do more professional shows. Oilar and his wife will be the coordinators for this year’s professional art gallery at the Indiana State Fair. John Oilar can be contacted for sales and commission work at (765) 362-3436.